para ayudar a las empresas pequeñas. Muchos piensan que tener una presencia en línea es muy complicado y costoso. El programa Get Your Business Online hace que sea rápido, fácil y gratis para que cualquier negocio lance su presencia en el Internet, desde ferreterías a escuelas de música. En el evento, el equipo de Google ayudará a los empresarios locales a crear sus propios sitios web cortesía de Intuit. Los empresarios también recibirán un nombre de dominio personalizado, alojamiento en el Internet gratuito durante un año, un perfil de ubicación en Google Maps, herramientas, entrenamientos, y recursos gratuitos. Expertos de Google estarán disponibles para capacitar a los empresarios en Inglés y en Español sobre las mejores maneras de atraer a más clientes en línea. Visite www.KansasGetOnline.com para más detalles sobre el evento y el programa. Si usted no puede asistir al evento, todavía puede obtener su propio sitio web y recursos gratuitos. Visite a la página web para obtener más información. El 97% de los usuarios del Internet buscan en línea para productos y servicios locales. Hay una gran oportunidad para atraer a nuevos clientes por medio del Internet, pero sólo el 44% de empresas pequeñas en Kansas tienen un sitio web o una presencia en línea. Google está ayudando a cambiar eso. Este jueves, Google llegará a Kansas City con su programa Get Your Business Online para ayudar a las empresas pequeñas. Muchos piensan que tener una presencia en línea es muy complicado y costoso. El programa Get Your Business Online hace que sea rápido, fácil y gratis para que cualquier negocio lance su presencia en el Internet, desde ferreterías a escuelas de música. look for local products and services online. This is a huge potential market for small businesses. Unfortunately, 44% of Kansas City small businesses don’t have a website or online presence. Google wants to help change that. This Thursday morning, please join us at Google’s “Get Your Business Online” event, where you’ll be able to set up a free website and a personalized domain name for your small businesses in under an hour. Register on the GYBO website now. At the event, Intuit will provide local businesses with a free website, and a team of Google experts will help participants build and design their sites. Businesses will also receive a customized domain name, free web hosting for one year, a local business listing on Google Maps and free tools, training and resources. Google experts will be on hand to train the business owners on how to reach more customers online in both English and Spanish. Go to www.KansasGetOnline.com for details on the event and the program and to register (Missouri businesses welcome, too!). And if you're unable to attend, you can still get a free website. Whether you’re a mechanic, own a mail and copy shop, or have a hair salon, we hope you can attend! 97% of Internet users look for local products and services online. This is a huge potential market for small businesses. Unfortunately, 44% of Kansas City small businesses don’t have a website or online presence. Google wants to help change that. For the past month, our Fiber TV customers have been able to control their TVs with any recent Android device. Using the Fiber TV app from the Google Play Store, they can search for programming, browse listings, and select shows or recordings with just the touch or swipe of a finger. Now, iPad users can enjoy this simple, intuitive experience, too. Head over to the Google Play store or the Apple App Store to download the free app now! Losing the TV remote just got a little less unsettling. 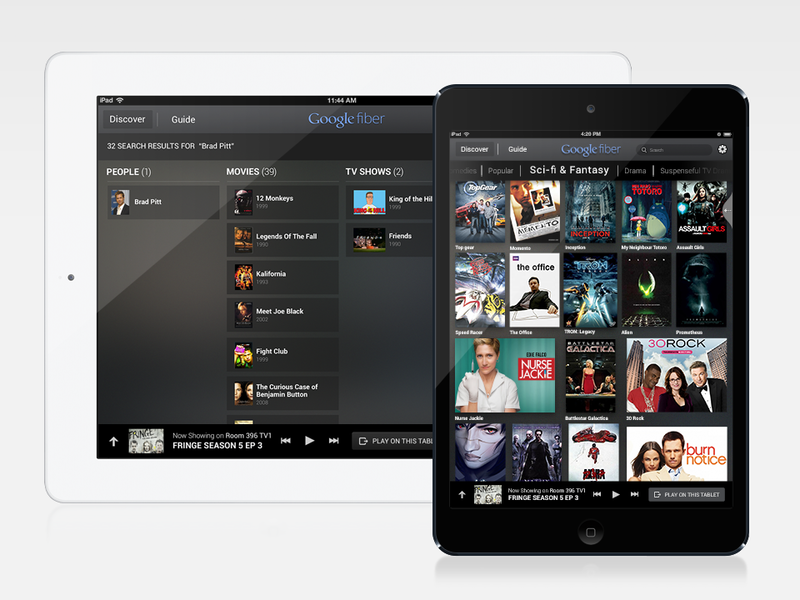 As of this morning, our Google Fiber TV app is available for iPad owners. team is in Provo, Utah, where Mayor John Curtis just announced that we intend to make Provo our third Google Fiber City. Utah is already home to hundreds of tech companies and startups, and many of them are based in Provo. In fact, the Provo area ranks second in the nation in patent growth, and is consistently ranked as one of the top places to live and do business in the U.S. We believe the future of the Internet will be built on gigabit speeds, and we’re sure the businesses and residents of Provo already have some good ideas for what they’d build with a gig. In order to bring Fiber to Provo, we’ve signed an agreement to purchase iProvo, an existing fiber-optic network owned by the city. As a part of the acquisition, we would commit to upgrade the network to gigabit technology and finish network construction so that every home along the existing iProvo network would have the opportunity to connect to Google Fiber. Our agreement with Provo isn’t approved yet—it’s pending a vote by the City Council scheduled for next Tuesday, April 23. We intend to begin the network upgrades as soon as the closing conditions are satisfied and the deal is closed. Provo started building their own municipal network in 2004 because they decided that providing access to high speed connectivity was important to their community’s future. In 2011, they started looking for a partner that could acquire their network and deliver an affordable service for Provoans. We’re committed to keeping their vision alive, and, if the deal is approved and the acquisition closes, we’d offer our Free Internet service (5 Mbps speeds) to every home along the existing Provo network, for a $30 activation fee and no monthly charge for at least seven years. We would also offer Google Fiber Gigabit Internet—up to 100x faster Internet than today’s average broadband speeds—and the option for Google Fiber TV service with hundreds of your favorite channels. We’d also provide free Gigabit Internet service to 25 local public institutions like schools, hospitals and libraries. Over the next few days, we’ll be in and around Provo with Mayor Curtis, attending community meetings and talking to residents about what widespread gigabit connectivity could mean for their community, and the ways in which we’d invest in their iProvo network. If you are a Provoan, we hope to see you there! In the meantime, you can sign up on our website to get updates and more information. Today the Google Fiber team is in Provo, Utah, where Mayor John Curtis just announced that we intend to make Provo our third Google Fiber City. or if you have any questions, you can always contact us. Jon Snow. Hannah Horvath. Sookie Stackhouse. If any of these names ring a bell for you, then you’re going to be very happy to hear that we’ve just added HBO to our TV lineup. Starting today, our Google Fiber TV customers will be able to add on our new HBO package to their plan for $20/month (plus tax). The plan will include HBO, HBO2, HBO Signature, HBO Family, HBO Latino, HBO Comedy, and HBO Zone. And, for those of you who are holding out for Cinemax, today is your lucky day, too — you can add our brand new Cinemax package for $10/month (plus tax), and get eight new channels, including Max, MoreMax, ActionMax, ThrillerMax, WMax, @Max, 5-StarMax, and OuterMax. If you really love TV and want both of these add-ons, we’ve just launched our new premium package, which you may want to consider. With the premium package, you can get STARZ, Showtime, HBO and Cinemax, all for $40/month (plus tax). You can sign up for these packages starting now. If you already have Fiber service installed in your home, you can call customer service 24/7 at 866-777-7550 to have any of these packages added. Folks that haven’t been connected to service yet can sign up for these packages on our website or if you have any questions, you can always contact us. , so that we can come connect you to Google FIber. If you’re not sure which fiberhood you belong to, just type in your address on our website, and your fiberhood info will pop up . As always, if you have any questions let us know! Now that the snow has melted and the warmer weather is hopefully here to stay, we’re ready to roll out service even faster across Kansas and Missouri. That’s why we’re announcing the deadlines for eighteen new Fiberhoods today. If you live in any of these fiberhoods, be sure to choose your Fiber plan soon, so that we can come connect you to Google FIber. If you’re not sure which fiberhood you belong to, just type in your address on our website, and your fiberhood info will pop up . As always, if you have any questions let us know! Our goal is to start connecting homes in Austin by mid-2014. Customers there will have a similar choice of products as our customers in Kansas City: Gigabit Internet or Gigabit Internet plus our Google Fiber TV service with nearly 200 HD TV channels. We’re still working out pricing details, but we expect them to be roughly similar to Kansas City. Also, as in Kansas City, we’re going to offer customers a free Internet connection at 5 mbps for 7 years, provided they pay a one-time construction fee. We’re also planning to connect many public institutions as we build in Austin— schools, hospitals, community centers, etc. — at a gigabit for no charge. If you live in Austin and want to sign up for more information, please visit our website. The Internet is still in its early days and has so much more potential to improve our lives. The web helps students and families access essential resources, from information about jobs and healthcare to banking and educational services. Communities that are connected to the Internet grow stronger because there’s greater potential to create jobs, drive economic growth, and help businesses succeed. We believe the Internet’s next chapter will be built on gigabit speeds, and we hope this new Google Fiber city will inspire communities across America to think about what ultrafast connectivity could mean for them. If you’re a city leader and you’re looking for some help making your city gigabit-friendly, have a look at this video from the FCC’s March 2013 Workshop on Gigabit Community Broadband Networks for steps you can take towards your own gigabit-powered future. We know that your time is valuable and so we’ve always focused on speed — from search to Gmail, Chrome to Android. Two years ago, we announced that we’d be bringing Google Fiber to Kansas City to show what’s possible with super fast Internet access, and since November we’ve been connecting homes there to gigabit Internet that’s 100 times faster than today’s average broadband performance. Today, we’re pleased to announce with Mayor Lee Leffingwell that Austin, Texas is becoming a Google Fiber city. It’s a mecca for creativity and entrepreneurialism, with thriving artistic and tech communities, as well as the University of Texas and its new medical research hospital. We’re sure these folks will do amazing things with gigabit access, and we feel very privileged to have been welcomed to their community.